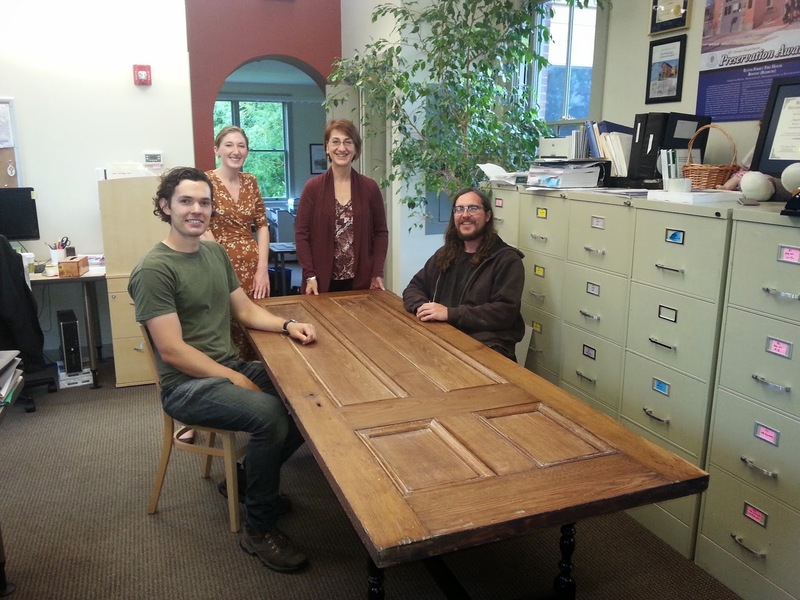 Inside Historic Boston Inc.: Original Fire House Door Returns to Eustis Street – as a Table! Original Fire House Door Returns to Eustis Street – as a Table! One of the original doors to the Eustis Street Fire House has made a triumphant return. Although, this time it is in a slightly different form. William Wheeler and Mike Fazio, students in the Cabinetry and Furniture Making program at the North Bennet Street School took the door, and turned it into a beautiful conference table. Wheeler and Fazio stripped many layers of paint from the door to reveal the original wood. They then built a base for the table with beautiful hand turned legs. We are thrilled to have the door back, and are excited by it's artful repurposing. It just goes to show that the stuff of old buildings can always be transformed to fit modern needs. Thanks again to Will and the North Bennet Street School!